Sisyphus played at the Abrons Arts Center this February, the newest avant-garde production from Experiments In Opera. Composers Jason Cady, Aaron Siegel, and Matthew Welch (acting as their own librettists) created a promising concept for an opera, with a cultural abundance of Greek myth at their disposal to create a beautiful libretto. However, this world premiere was a case of more tragedy, full of missed opportunities, rather than inspiring. The beloved tale of Sisyphus seems the perfect subject for an opera. The wise and prudent king, a symbol for greed and indulgence, beholding a tragic flaw in his chronic disposition for deceit, is eternally dammed to mindlessly roll a boulder up a hill only to see it tumble back down again. The opera begins as a daring modern reinterpretation of this myth and promise of enlightenment. The piece composed in three parts, by three composers, begins first with Cady’s introduction to Sisyphus, his legendary ego and his infamous punishment. Siegel follows with his modern interpretation of Argina, whose capture by Zeus is betrayed by Sisyphus, with Welch focusing on the hell of Sisyphus’s punishment. While at moments clever, the opera was inconsistent at best. There were a number of one-line jokes that held true to the Greek theater’s sensibilities and fondness for sexual innuendo. At other times the humor seemed merely deadpan; gags that were not earned by the libretto that seemed like private in-jokes. It was a triumph of the opera to make relevant and personal an ancient story. The collaboration of the three writers and their ability to create a cohesive production was one success of the evening. The greatest success of the night, however, was the commitment and fluency with which the opera’s three stars took on and delivered beauty from a wanting libretto. Mezzo-soprano Kate Maroney presented the futility of Sisyphus’s punishment through the repetitive torments of obsessive-compulsive disorder. Featuring constant counting, she delivered intrigue with warmth of tone balanced by a sense of frustration and despair. Soprano Lucy Dhegrae presented with stunning beauty the infatuated mortal focus of Zeus’ immortal affections. The libretto thankfully allowed her one embellishment in the composition “the Eagle” where, while singing of her love and desire to be united with Zeus, her bright bell tones transcended the concrete theater with visions of the heavenly Olympus. As the instrumentation droned with strong bass-toned songs her voice truly soared. Tenor Vince B. Vincent boldly took on the role of Sisyphus with a voice indulgent and full; a fine homage to the tragic weaknesses of his character. He was afforded little character development and a disappointing bastardization of Sisyphus’s torment in the song “Regret.” It seemed a cheap pandering without depth or real understanding of the torment. Vincent delivered with a fullness of tone and great vocal strength but it seemed an oversight by director Ethan Heard by allowing the physicality to go too far without first creating an intimacy with the misery and anguish; it was a cheapening of the evening’s experience. The opera ended with an unnecessary heist scene that took away the romance of what could have been a very resplendent story of Greek tragedy and indulgence. The orchestrations were underdeveloped and poorly conceived. They did not serve to assist the characters’ development or singers’ performances. Possibly the droning of the ensemble was an intentional reflection of Sisyphus’s punishment continuously rolling of the boulder up the hill; however, it grew tiring and dull for the audience. What are truly missing from the orchestrations of Sisyphus are the romance of Greek theology and the grandness of the halls of Zeus and Olympus. 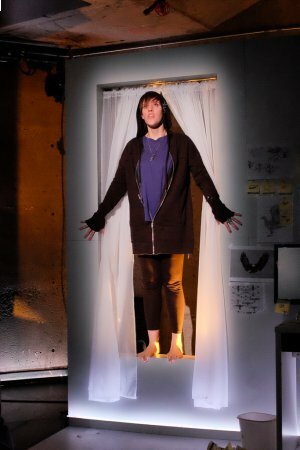 Huge congratulations to stage designer Kristen Robinson who transformed the concrete basement in collaboration with lighting designer Masha Tsimring into an environment both modern and fitting. Also to the impressive costume by Maria Hooper on her magnificent embodiment of Zeus as an eagle, by transforming tenor Vince B. Vincent into the creature that stole the show. 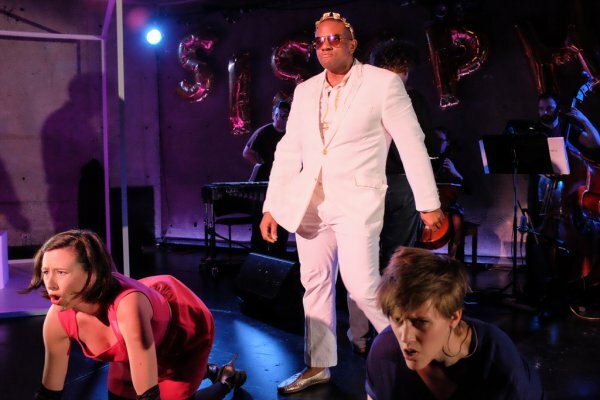 Experiments in Opera exists to enable new collaborative processes and to embrace the eclecticism of New York’s contemporary and DIY music scenes, aiming to support today’s composers looking to tell their stories through music. It is a shame that ‘experiment’ in this context seemed like an apology to get away with a crude, half-hearted interpretation at the cost of a beautiful legend and promising concept. DiBenedetto demonstrates that the sewing machine, manipulating textiles, will make music. Agnew shows that little cloth tags can be assembled to create a portrait of beauty's creation, and beauty itself. A chorus line of singing and dancing fetuses and audience input are in this mesmerizing offbeat musical that thoughtfully explores the issue of abortion.